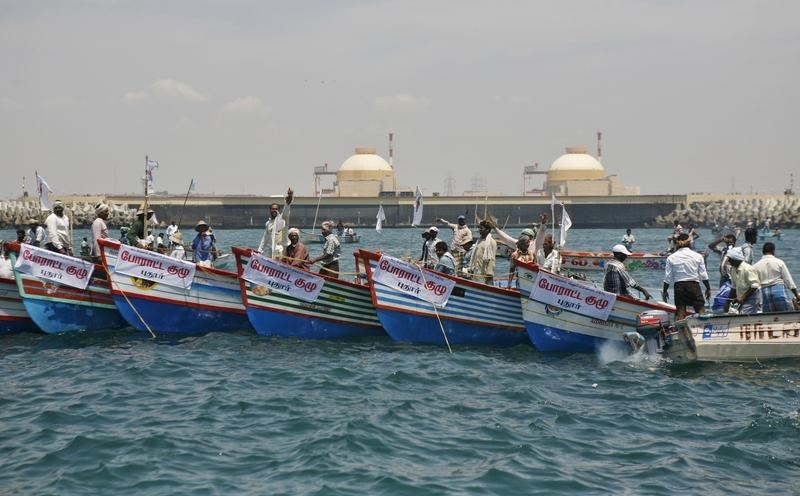 Demonstrators stand in their boats in the Bay of Bengal during a protest near the Kudankulam nuclear power project in the southern Indian state of Tamil Nadu on October 8, 2012. September 23, 2014 – Authorities in India should stop using sedition and other laws against activists and protesters who have peacefully opposed a nuclear power plant in Tamil Nadu state, Human Rights Watch said today. In the latest incident, immigration officials on September 16, 2014, prevented the environmental activist S.P. Udayakumar from traveling out of the country because of various cases filed against him for leading protests at the Kudankulam nuclear power plant. The Indian parliament should repeal the colonial-era sedition law, which has been repeatedly misused to harass activists and peaceful protesters. Since October 2011, police in Tamil Nadu state have filed thousands of complaints against local residents peacefully protesting the Kudankulam plant, accusing them of sedition and other serious crimes. While formal charges have rarely been brought, the complaints leave those targeted at risk of perpetual harassment by the authorities. Villagers from fishing and other communities concerned about adverse effects on their health and livelihoods have protested against the plant in Tamil Nadu. Their fears were exacerbated by the meltdown of the Fukushima nuclear plant in Japan in the wake of a tsunami in 2011, since many in Tamil Nadu had experienced the 2004 Indian Ocean tsunami. Instead of allaying their concerns, authorities have accused over 50,000 people of sedition, waging or abetting war against the state, disrupting harmony, insulting national honor, criminal trespass, and unlawful assembly. Over 300 police First Information Reports (FIRs) were filed, but after two years, Tamil Nadu police have brought charges in only two cases. Police have yet to file charges in any of the sedition cases. While the police reports accuse several people by name, thousands are unnamed, allowing the authorities to abuse their powers by arbitrarily adding other names later. In just one example, FIR 195/12, filed on May 7, 2012, lists S.P. Udayakumar and 25 others by name, and 2,225 unnamed people as the accused. On May 6, 2013, the Supreme Court, even as it gave a go-ahead to the nuclear plant, said that, “Endeavour should be made to withdraw all the criminal cases filed against the agitators so that peace and normalcy be restored at Kudankulam and nearby.” In April 2014, ahead of India’s national elections, the Tamil Nadu government announced it would drop 248 out of 349 cases. In an affidavit before the Supreme Court, the state government said it could not withdraw the remaining 101 cases because they related to serious crimes such as sedition, and attacks on private individuals and public officials. Udayakumar, convener of the People’s Movement Against Nuclear Energy (PMANE) [and of the TRANSCEND Network], was on his way to Nepal on September 16 to participate in a United Nations consultation on human rights, but was detained and interrogated at the New Delhi airport for over five hours. At 7 p.m., immigration officials released Udayakumar but told him that he should not try to leave the country. They said that Tamil Nadu authorities had put his name on a lookout notice, thereby restricting his travel. India’s sedition law, section 124A of the Penal Code, prohibits any words, either spoken or written, or any signs or visible representation that can broadly cause “hatred or contempt, or excites or attempts to excite disaffection” toward the government. In a landmark ruling in 1962, Kedar Nath Singh v. State of Bihar, the Supreme Court said that unless the accused incited violence by their speech or action, it did not constitute sedition, as it would otherwise violate the right to freedom of speech guaranteed by the Constitution. However, over the years various state governments have disregarded the ruling and accused human rights activists, journalists, writers, and a political cartoonist under the sedition law. The International Covenant on Civil and Political Rights, which India ratified in 1979, prohibits restrictions on freedom of expression on national security grounds unless they are provided by law, strictly construed, and necessary and proportionate to address a legitimate threat. Such laws cannot put the right to free expression itself in jeopardy.